Memory cells (address + value pairs with additional data, ) are stored in a map-like container so that a cell can be accessed in logarithmic time given its address. The keys for the map are generated from the cell virtual addresses, either by using the address directly or by hashing it. The function that generates these keys, generateCellKey, is pure virtual. Definition at line 27 of file MemoryCellMap.h. Key used to look up memory cells. The key is generated from the cell's virtual address either by using the address directly or by hashing it. For instance, a concrete domain might use the address directly while a symbolic domain will probably hash the symbolic address expression. Definition at line 34 of file MemoryCellMap.h. Map of memory cells indexed by cell keys. Definition at line 37 of file MemoryCellMap.h. Shared-ownership pointer for a memory cell map object. Definition at line 73 of file MemoryCellMap.h. Promote a base memory state pointer to a MemoryCellMap pointer. 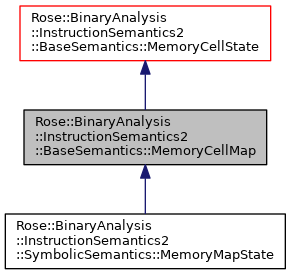 The memory state, x, must have a MemoryCellMap dynamic type. Definition at line 78 of file MemoryCellMap.h. Generate a cell lookup key. Generates a key from a virtual address. The key is used to look up the cell in a map-based container. Look up memory cell for address. Returns the memory cell for the specified address, or a null pointer if the cell does not exist. The address is used to look up the cell in logirithmic time. This is just a convenience wrapper around matchingCells that returns either the (single) cell found by that function or a null pointer. Consults the memory represented by this MemoryState object and returns a semantic value. Depending on the semantic domain, the value can be a value that is already stored in the memory state, a supplied default value, a new value constructed from some combination of existing values and/or the default value, or anything else. For instance, in a symbolic domain the address could alias multiple existing memory locations and the implementation may choose to return a McCarthy expression. Additional data (such as SMT solvers) may be passed via the RiscOperators argument. The size of the value being read does not necessarily need to be equal to the size of values stored in the memory state, though it typically is(1). For instance, an implementation may allow reading a 32-bit little endian value from a memory state that stores only bytes. A RiscOperators object is provided for use in these situations. In order to support cases where an address does not match any existing location, the dflt value can be used to initialize a new memory location. The manner in which the default is used depends on the implementation. In any case, the width of the dflt value determines how much to read. Footnote 1: A MemoryState::readMemory() call is the last in a sequence of delegations starting with RiscOperators::readMemory(). The designers of the MemoryState, State, and RiscOperators subclasses will need to coordinate to decide which layer should handle concatenating values from individual memory locations. Consults the memory represented by this MemoryState object and possibly inserts the specified value. The details of how a value is inserted into a memory state depends entirely on the implementation in a subclass and will probably be different for each semantic domain. A MemoryState::writeMemory() call is the last in a sequence of delegations starting with RiscOperators::writeMemory(). The designers of the MemoryState, State, and RiscOperators will need to coordinate to decide which layer (if any) should handle splitting a multi-byte value into multiple memory locations.